I had the opportunity to pair up with Shop Rite Supermarkets during the NYCWFF Blogger's Virtual Food Tour this month. This is the sixth stop on the ShopRite #NYCWFF Virtual Food Tour! All week long, different bloggers are recreating recipes that will be featured at the New York City Wine and Food Festival Grand Tasting Presented by ShopRite Food Stores. As you might remember in the past years, I have attended the Yotam Ottolenghi dinners, as well as the April Bloomfield and Nancy Silverton events in Manhattan all to benefit NO KID HUNGRY and the NYC Food Banks. 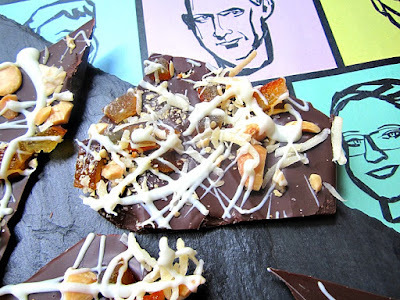 Here, I created a recipe using Ghirardelli chocolate melting wafers, which were delicious and a great way to bake with chocolate. 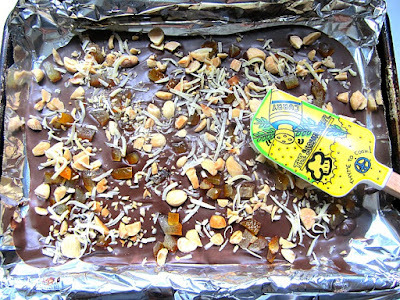 You can choose any combination of toppings....I chose Marcona almonds, candied orange peel, flaked coconut & drizzled Ghiradelli white chocolate over it all. Make sure you have all your toppings ready to go, since the chocolate hardens quickly, you have to work fast. 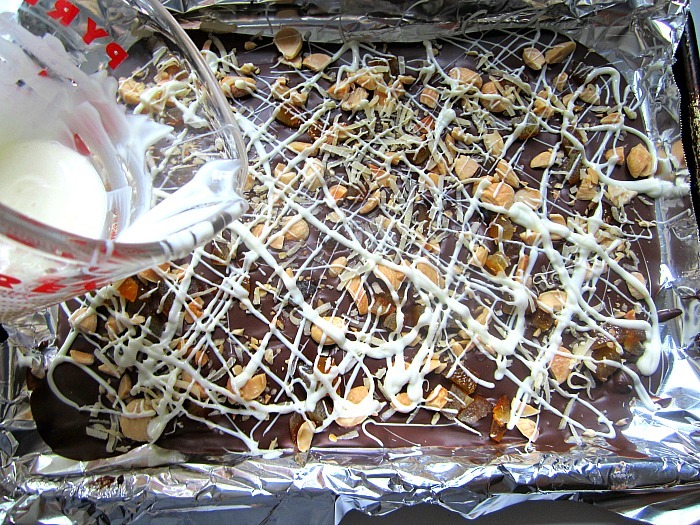 Line a large baking sheet with heavy foil; set aside. 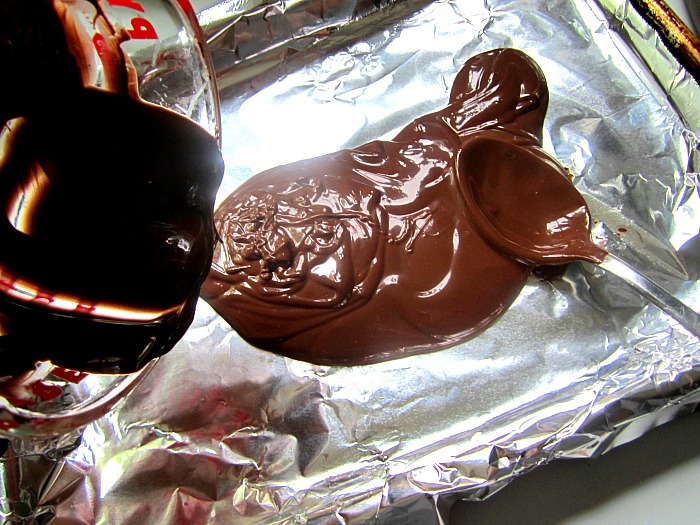 Place Ghirardelli Dark Melting Wafers in a microwave-safe container. Microwave at half power or defrost setting for 30 seconds and then remove and stir thoroughly. If not completely melted, continue to microwave at 15 second intervals and stir until smooth. Overheating will cause wafers to burn. Spread melted wafers on prepared baking sheet in a 10x8 inch rectangle, about ¼ inch thick. 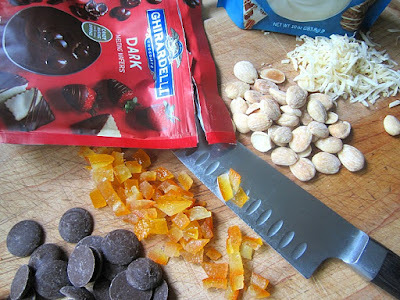 Immediately sprinkle chocolate with desired toppings; press toppings gently into chocolate. 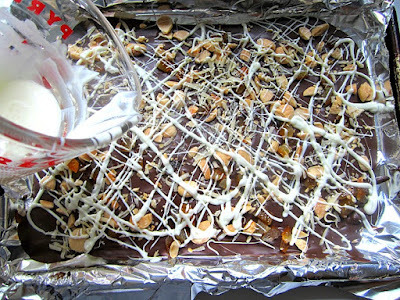 Melt the Ghiradelli white chocolate melting wafers in a separate microwave safe bowl and drizzle over the toppings with a fork. Chill for 30 minutes or until firm. Carefully break candy into pieces. To store, layer candy between sheets of waxed paper in an airtight container; cover. Store in refrigerator for up to 2 weeks. 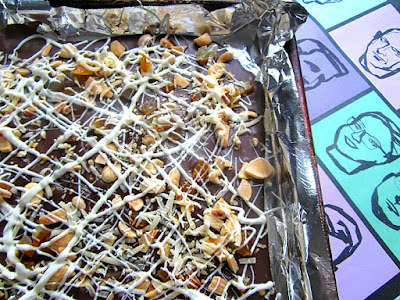 *To toast nuts or seeds, preheat oven to 350 degrees F. Spread nuts or seeds in a shallow baking pan. Baked for 5-10 minutes or until light brown, watching carefully not to burn, shaking pan once or twice. Check out Non Perfect Parenting’s blog tomorrow for the next recipe on the ShopRite #NYCWFF Virtual Food Tour - Bruschetta with Roasted Red Peppers and Burrata. Celebrate the spirit of the festival at home, and find everything you need at your local ShopRite. disclaimer: ShopRite provided me with all the products used for this recipe for my involvement in the NYCWFF Food Blogger Tour, but all opinions expressed are my own.